THE sun is getting ready to draw the curtains on yet another day by slowly sinking behind the Western Ghats in the forests of South India. Its effect is felt by the entire sky bathed in a crimson glow. The vast expanse of the backwaters of the Sharavathy valley is shimmering in the soft evening light. The gusty afternoon wind is dying down to be replaced by a cool evening breeze. Swaying in response, the tall bamboos creak and rustle as they rub against each other. Most birds are speeding to their homes. Those already at their nests in the abundance of the tropical foliage are chirping energetically before retiring for the day. An odd ruby-throated bulbul is scampering for any last bits of food it may gather for its chicks. A transcendental peace descends on the region and it seems like the end of the day. A trip to the end of land on a two-wheeler! Well, maybe not for everyone. Two miles away from the mainland is Korigudda, one of the many islands dotting the backwaters. While most of the world gets ready to rest, this island is still bustling with life. A group of eco-tourists are in an exhilarated mood after canoeing in the azure green waters and revelling in the coziness of the tropical jungle. It is only the beginning of their encounter with the Western Ghats and are looking forward to the exciting days ahead on the "Ghats-to-Sea" circuit of their eco-tour. The Western Ghats stretch nearly 900 miles along south-west peninsular India and stand as testimony to several million years of geological history. The 'Ghats' as they are known to locals basically means mountains. They are separated from the Arabian Sea by a narrow strip of the coast. These verdant hills extend from Gujarat in western India to Tamil Nadu in the South passing through Maharashtra, Goa, Karnataka and Kerala, rising and falling between 3000 and 6000-ft.
With enough reason, the Ghats have been identified as one of the 18 ecological hotspots of the world that need immediate attention. Thanks to the Ghats, India is one of the countries that can boast of a rich bio-diversity. It is one of the richest biotas of the country, next only to the Himalayas. This region has the distinction of possessing 20 per cent of the world's plant species in spite of occupying barely 0.5 per cent of the earth's surface. 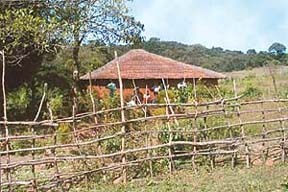 The Ghats shelter innumerable varieties of flora, fauna, many of which are endemic and close to extinction. Even today, researchers stumble upon species that many believe had disappeared from the face of the earth. Plants of immense medicinal value with their inherent "bio-prospects" are yet another coveted treasure of the Ghats. Rama Naik's rugged features are partially masked by the blobs of mud splattered all over his body. Bright shiny eyes gaze from a large face that seems to defy time. His big welcoming smile displays reddened teeth, revealing his love for betel and areca nut, an addiction that most people here grow up with. He has been working all day in knee-deep slush to plough his rice fields for planting the saplings. His working companions—a pair of bullocks—get a taste of the flog when they dare ignore his bellows. The clouds are looming large, the monsoon is round the corner and he just cannot lose time. Kanoor is a typical village in the Ghats, houses spread far and apart. 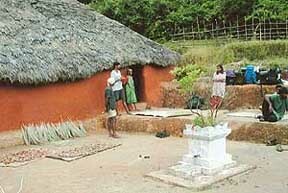 Rama Naik's wooden house, built all by his own family is one among the few scattered in this hamlet. Brick tiles replaced the thatched roof only two years ago, thanks to the unusual bumper harvest of rice and areca nut. The rain god was kind enough and the middlemen didn't fleece him. He can breathe in peace during the relentless ravage of the monsoon. The scene has now shifted to Kanoor tucked deep in the Sharavathy Wildlife Reserve amongst the ranges overlooking the Sharavathy valley. The group members who hiked six miles through the jungle and tiny hamlets are now guests of Rama Naik and savoring the huge jackfruit ripped open by him. "Bears love these", Rama Naik explains to his guests, pointing to the yellow flesh of this tropical fruit. "Bisons, bears, snakes and even tigers are no strangers to our village", he adds. Bheemappa, Rama Naik's neighbor still rues about his best milching cow slain by the tiger last summer. The Sharavathy River flows not far from Kanoor and is one of the principal rivers of the Western Ghats in Karnataka. 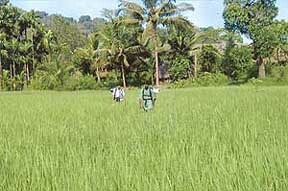 Sharavathy and its tributaries are the lifeline for most of the inhabitants of this region. Culture and heritage soon mingle with adventure to accentuate the exotic character of the eco-tour. The group camp the next night in the precincts of a 11th century temple called Bheemeshwar, providing a panoramic view of the Ghats and its folds. Next to the ancient stone temple, which mirrors Jain architecture of that era is a fresh waterfall cascading from a height of 50 feet. There is an ethereal touch to the entire surroundings. Monkeys swing across the rock ledges and banana trees. 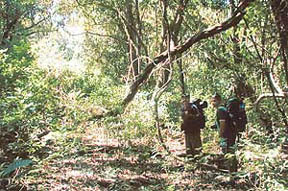 Some team members set out exploring a path through the maze-like forest to the top of the falls while others try to capture the antics of the primates on film. A few others befriend the local devotees who come trekking to offer prayers to the deity of Lord Shiva. Girls with pretty forest flowers in their hair giggle at the sight of the tourists. Most people in the surrounding villages believe that the history of the temple dates back to the time period of the great Indian epic, the Mahabharatha. The story of the 'Pepper Queen' awaits the group as they continue their hike towards the Kanoor Fort. It is breath taking - as one of the volunteers reconstructs history of the pepper that quickly transports the group back into the 16th century. The queen protected her kingdom sandwiched between the turbulent Arabian Sea and the towering Western Ghats. She deftly traded pepper with the Portuguese colonists to retain her supremacy in the region. The vivid narration and the ambience of the fort amidst the jungle are indeed a rare tryst with history. The trail, which the group has so long pursued from Rama Naik's house, starts winding downhill on the Western flank of the Ghats. Down and down it goes to end at the Sharavathy river again. A dug-out canoe waits to ferry the group downstream to where the Sharavathy races to meet the Arabian Sea. And for the travellers yet another enchanting experience is about to unfold. What better way to conclude the romance with the Ghats than spending the last few days on the unspoiled golden coast of South India? Rarely does one see the tropical mountains dip right into the sea and it happens right here along the shore of north-west Karnataka. Naive folk of the coastal villages, in their cluster of thatched huts amidst coconut and palm groves personify life at its innocent best. The members of the Halakki tribal community of coastal Karnataka provide hospitality to the team at the end of its sojourn in the Ghats. The team is engrossed watching the Halakkis pound the rice to separate the husk, nourish the children, sing as they work in the fields and go about other daily chores. The Halakkis are one of the several indigenous tribes that live in the Ghats and on the coast. The Halakki women are easy to recognise in their vibrant saris and unusual necklaces of black beads. Reluctantly, the group bids adieu to their newfound tribal friends and to the Ghats. The day-to-day life of those living in the Ghats is the real essence of the Western Ghats. Eating on plantain leaves, drinking from cups made from the bark of trees, spending time with the villagers and tribal communities- they provide for an impacting exposure to the life of a new world tucked unto itself in these rainforests of Southern India. Besides the physical challenge of the rugged hills, the tryst means a far more fulfilling experience. The Western Ghats are undoubtedly the economic powerhouse of the region. They form the region’s main watershed with giant rivers originating from them. The 200-odd dams meet most of the hydroelectric needs of the region across the rivers and their tributaries. The climate suits growing of commercial crops like cashew, coffee, rubber and tea. Vanilla and cocoa are getting popular too. Spices like cardamom, pepper, cinnamon from here is the pride of this belt and exported all over the world. A boom in the prices of these commercial crops has taken its toll on the Ghats and will continue to do so. The hills are rich in mineral deposits and are relentlessly exploited to quench the needs of international and domestic markets. The Ghats, which boasted of over 60 per cent of forest cover in the 50s, has dropped down to nearly half of that and is decreasing further at an ominous rate. For all its ecological significance, the Western Ghats has never received its fair share of global attention. Eco-tourism has helped overcome this deprivation and has made more people appreciate the treasure trove that lies here. A journey through the Ghats leaves one wondering if a turnaround is ever possible for the fragile ecosystems of the world that already seems to be in their twilight days. The carving up of tropical forests for cultivation, increasing human and livestock population, poaching, dam building, mega industries and mining projects in the offing and other insidious threats from vested interests—all are reasons to be pessimistic. As more and more people interact with these hills and are witness to the threats, one hopes their endearment to this natural area will prove handy in curtailing the damage. What the ghats need is indeed nothing too big, but a determined will by the very people dependent on them (both directly and indirectly) to see them through this stressful phase.